This monthly treatment from Bayer is a strong and dependable way of eliminating fleas and ticks. This shampoo is the perfect method for controlling and killing ticks throughout their life cycle. This is a great way to kill tick eggs and prevent them from becoming fully grown ticks. Tick powder is great because you do not miss a single spot on your pet and it's easy to apply. Ticks are so familiar with dogs that we often overlook how important it is to protect our feline companions. Depending on where you live depends on how serious a tick bite will be to your dog. It doesn’t matter if your dog is an inside or outside dog-it should still get protection against dangerous ticks. In this article, we are taking a look at the best tick repellents that ensure you will not have a serious tick issue with your dog. Bayer Advantage Flea and Tick treatment come in a variety of different sizes that are fit to meet the individual needs of your dog based on their weight. The medicine is simple to apply, and since you only need to give it to them once per month, it does not have to stress them out. 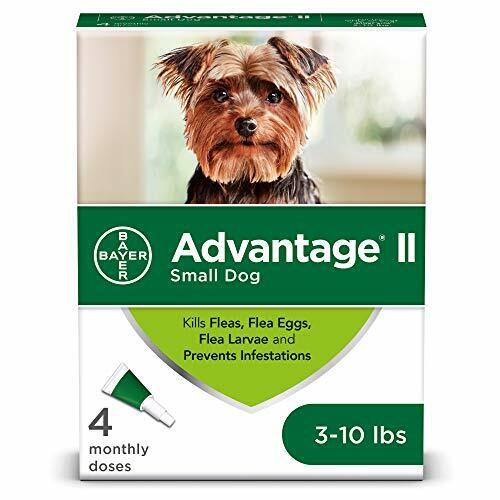 Bayer products are recommended and used by most Veterinarians, and the treatment kills fleas and ticks in all stages of life from egg to full grown adult. Typically with a lot of treatments, it requires the tick to bite your dog for the poison to work. With Bayer Tick Treatment the liquid is topical, so it kills the ticks on contact, and your dog does not have to get bit. Once applied to your dog’s skin it begins working in 12 hours and lasts for 30 days. This is a high-quality shampoo that works excellent at killing fleas and ticks on dogs and cats. It kills ticks in all stages of life ranging from eggs to fully matured adults. The shampoo contains a blend of aloe, coconut extract, lanolin, and oatmeal, so it is gentle on your pets. Once you treat your pet, protection lasts for up to 28 days. The shampoo is also gentle on you, so you do not need to wear gloves or any protective clothing when using it on your pets. Other people reviewing this product have also recommended that you keep your pets outside after using the shampoo for the first time because there will be a ton of dead ticks on the floor. This spray is intended for use on dogs and cats for relief from ticks and fleas. Once applied to the skin of your pets they’ll have relief for up to eight weeks before you need to treat them again. 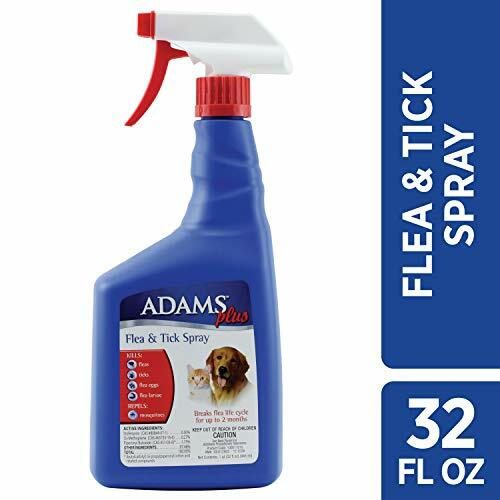 The main purpose of this spray and the thing that makes it slightly different from everything else is that its direct goal is to interrupt the life cycle of the fleas and ticks. 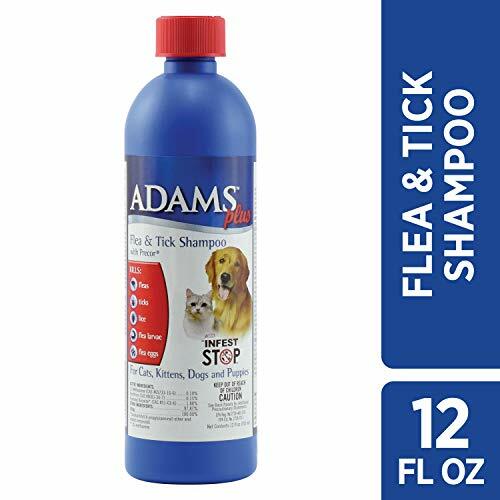 The Adams spray is intended to kill the tick eggs before they become adult ticks. Doing this ensures that once you eliminate the adult ticks from your pet that you will not deal with a re-infestation later on down the road. 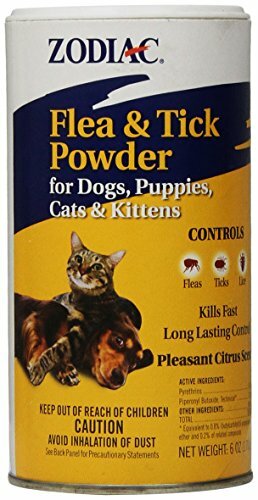 This six-ounce container of tick repellent powder is excellent at keeping a variety of pests away from your house pets. The powder controls fleas, ticks, and lice. Once you spread the powder on your pet, it kills the fleas and ticks on contact. The container itself is easy to use and spreading the powder on your pet is quick and straightforward. You shake the container over your pet and then rub the powder into their skin and its great for getting every little section of their fur. Ticks are blood sucking parasites that jump onto your dog and cut a small hole in their skin. Ticks are blood sucking parasites that jump onto your dog and cut a small hole in their skin. Once they cut the hole, they stick their head into it and begin sucking their blood. If a lot of ticks latch on to your dog, this can cause anemia and ticks also carry diseases like Lyme Disease. Lyme Disease causes swelling on the dog’s joints. This disease causes your dog to feel lethargic and even depressed over time. If you believe your dog has ticks, do not wait to get help. Try out one of the tick repellents above or if the issue is severe enough, take them to see a veterinarian. Lyme Disease causes swelling on the dog’s joints. This disease causes your dog to feel lethargic and even depressed over time. If you believe your dog has ticks, do not wait to get help. Try out one of the tick medicines above or if the issue is severe enough, take them to see a veterinarian. It’s virtually impossible to prevent your dog from getting ticks because they are going to go where they want to go. There are some things you can do though to help control their environment, so ticks do not want to be around your yard. The best way to ensure ticks do not become a problem is to use a regular monthly tick treatment on your dog. This is the best way to treat the issue before it becomes an issue. Keep your yard properly maintained. Make sure the grass is cut low, there are no overgrown bushes, and everything underneath porches is well trimmed. Ticks like cool areas, so they like to rest at the base of the tall grass. If you limit the amount of tall grass in your yard, you are decreasing the chances of your dog coming in contact with a tick. Keep your yard adequately maintained. Make sure the grass is cut low, there are no overgrown bushes, and everything underneath porches is well trimmed. Ticks like cool areas, so they like to rest at the base of the tall grass. If you limit the amount of tall grass in your yard, you are decreasing the chances of your dog coming in contact with a tick. Create a woods buffer. If you put something like mulch at the perimeter of your yard along the woods line, the ticks will be less likely to move into your yard. So, you have decided that ticks are a problem and you want to start treating it. Finding the right product for your pet is an important decision, so we want to help make it easier for you. In this section, we are going to break each product down a little more into how each one benefits your pet. This method is typically the most popular because it takes a lot of the thought away from treating your animals for ticks. You continue to give the treatment to them month after month whether they have ticks or not. After they get the treatment, they should not have ticks again, so you do not have to worry. This is definitely the most proactive approach to getting rid of ticks. Ticks do not like water so using a tick shampoo in a bath is also a great method. If your dog likes water and does not mind getting a bath, then you should consider using shampoo. You will wash your dog like you normally would, and once you go to rinse him/her off, you will notice all the ticks falling off into the water. Like every other pest repellent-sprays are nice because they are simple to use and do not require much work. They are typically not as effective as the previous two methods because they require contact to be effective and it’s easy to miss spots on your dog. If you decide to use a spray, be thorough and cover each part of your dog. One of the advantages of spray is you can treat furniture and fabrics with this as well for extra protection. Similar to spray powder can be less effective than some other methods but one thing we like about powder is it’s easy to cover your entire dog without missing any spots. The powder goes on heavy, and you rub it into your dog’s skin.